The Arkansas lease agreements may be used for any landlord-tenant arrangement where the utilization of space, commercial or residential, by a tenant in return for payment agreed upon rent. All residential agreements should use Title 18, Subtitle 2, Chapter 17 (Arkansas Residential Landlord-Tenant Act of 2007) for reference and commercial contracts should review Chapter 2a (Leases) of the Arkansas Uniform Commercial Code. Rental Application – All leases, before being signed, should have the tenant undergo a lookup of their credit, employment, and income verification to make certain that the tenant’s background is correct. Commercial Lease Agreement – Designed for a business or individual seeking to operate from either office, retail, or industrial space. Lease with Option to Purchase (Lease to Own) Agreement – A standard template with the added option of purchasing within a certain period. Month to Month Lease Agreement (§ 18-17-704) – Known as a “tenancy at will” therefore the occupancy period renews automatically with payment and ends upon at least thirty (30) days’ written notice (unless the contract states otherwise). Room Rental (Roommate) Agreement – Between the members of a home where each of them rent a bedroom and share all common areas. Standard Lease Agreement – Fixed term, commonly twelve (12) months, for any type of residential property including an apartment, condominium, or house. Sublease Agreement – Allows a tenant to let another individual occupy and payments may be made payable to either themselves or to the landlord directly. 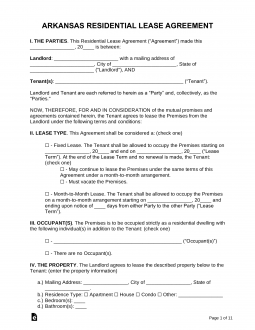 Termination Lease Letter – Notice is given by either a lessor or lessee to the other in order to notify that they wish to end the occupancy. Arkansas has No Required State disclosures for their landlords to attach. Lead-Based Paint – Required for any housing structure built prior to 1978 as the harmful substance may be in prior layers of paint and pose a danger with any cracking or chipping walls. No notice is specified by the State but for good landlord-tenant relations it is recommended, not required, to contact the tenant before any non-emergency entry to the premises. Maximum (§ 18-16-304) – Landlord may not charge in excess of two (2) months’ rent to the tenant. Returning (§ 18-16-305) – All funds must be returned to the tenant within sixty (60) days. If the landlord cannot find or get in contact with the tenant for up to one-hundred and eighty (180) days after the termination date then the money becomes the property of the landlord.